If you live in an American city and you don’t personally use a wheelchair, it’s easy to overlook the small ramp at most intersections between the sidewalk and the street. 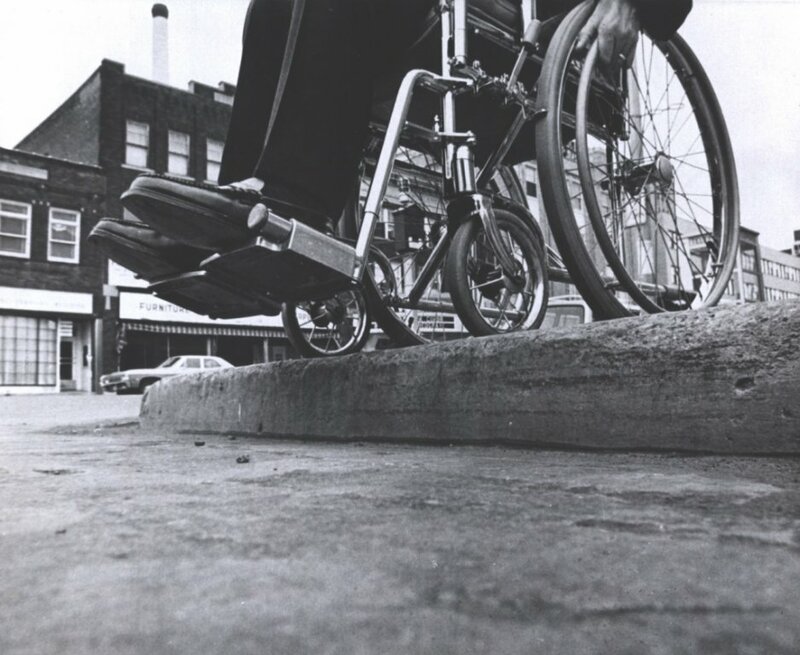 Today, these curb cuts are everywhere, but as recent as fifty years ago – when an activist named Ed Roberts was young, most urban corners featured a sharp drop-off, making it difficult for him and other wheelchair users to get between blocks without assistance. Roberts was central to a movement that demanded society see disabled people in a new way. He had polio, which left Roberts paralyzed below the neck, only able too move two fingers on his left hand. Back in the 1940’s and 50’s, there were a few communities across the country where people had tried to make the built environment more accessible. For example, there was a coach in Illinois woking with disabled soldiers who badgered reluctant officials at the University of Illinois until finally the school set up a rehab and education program with wheelchair sports and wood ramps were installed in the buildings. Historians discovered another example in Kalamazoo, Michigan. This community had extra high curbs. After WWII a retired veteran got so fed up watching other disabled vets struggling to cross the street that he persuaded city officials to cut ramps into the sidewalks at four downtown corners. But by the late 1960s and70s, the new wave of young disabled activists weren’t going to wait around for the occasional enlightened college coach. They demanded. They were insistent. They didn’t wait for permission.To this day, stories circulate about the Rolling Quads riding out at night with attendants and using sledgehammers to bust up curbs and build their own ramps, forcing the city into action. But Eric Dibner, who was an attendant for disabled students at Berkeley in the late 1970s, says that the stories of the midnight commandos is a bit exaggerated. “We got a bag or two of concrete,” he elaborates, “and mixed it up and took it to the corners that would most ease the route.” While it did happen at night, they only hacked a few curbs. 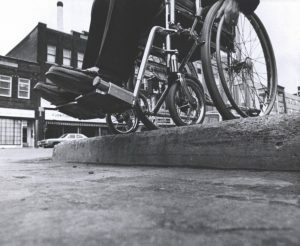 By the mid 70s the disability rights movement was growing and spreading, with groups around the world advocating for changes in the built environment to enable more independence. This didn’t mean just curb cuts, but also wheelchair lifts on buses, ramps alongside staircases, elevators with reachable buttons in public buildings, accessible bathrooms, and service counters low enough to let a person in a wheelchair be attended to face to face, and more. In 1980, disabled people in Denver staged a protest demanding curb cuts. They’d already blocked traffic until city transit officials promised Demonstrators in wheelchairs leaned over, for the photographers, to whack at concrete curbs with sledgehammers. In 1990, while the Americans with Disabilities Act was signed into law, disabled demonstrators left their wheelchairs and crawled up the marble steps of the Capital building to make sure the bill went through.